Our third game of the year against Old Melburnians was always going to be a challenge – OM’s had almost rolled Old Xavs in round two and have earned their reputation as a seriously combative football side. We prepared as well as we could and made some personnel changes, with key senior players Ant Forato, David Lowe & Frank Pickett all playing their first game of the year. Andrew Walker was a welcome return from injury and pre-season standout Scotty Vawser was selected for his first game in 2017. As expected, OM’s applied a heap of pressure but we were able to generate plenty of run, especially from our defenders. Sam Haslem was a standout early setting the standard with his tackling whilst Jason Tutt’s run & carry was reflective of the De La brand of footy. Adrian Indovino, Sean Fisher & Ed Clinch all kicked three goals and Frank Pickett brought some much needed hardness to our side, something which had been lacking in the first couple of rounds. Tom Humphrey, David Convery & Jake Gotch were all assigned specific roles and they all won their respective contests throughout the game. We led at every change but it was only by four points at three quarter time and the game was well and truly in the balance. In the last we ran the game out well, getting over in the end by 28 points. The most pleasing aspect was that we played our brand of football, with every player contributing to the win. The Reserves headed off to Sportscover Arena hoping to register our first win for 2017 against OM’s. We had a couple of withdrawals early Saturday morning, which forced us to call on our emergencies against a team who were also looking for their first win. Like the first two weeks, we were well in the contest at half time trailing 6.5.35 to 2.6.18. In the third, OM’s kicked six straight to our 2.2 but Big Matt Cullinan dominated the ruck and Sam Michael was in everything off a wing. Our boys were having a crack but we played the game in spurts, good for ten minutes then poor for ten. This is something we need to address. At the last break I urged the boys to just play the game we play – play on and get it in deep quickly. Ben Nethersole and Dean Krelle had good last quarters, kicking goals to give us a lift. We broke even with them in the last quarter, kicking three goals to go down 14.8.92 to our 6.11.47. Three losses from three games is not ideal, however lots of positives are coming out of these games. We’re a very young side getting better each week and a win is not far away. Looking forward to next week, I sense a big effort from the Two’s against Uni Blacks. After a positive couple of weeks, we were looking to keep the momentum rolling against some quality opposition in Beaumaris. The game was intense early. Our pressure around the ball was good and we were extremely competitive in the first quarter. But from then on, we were comprehensively outplayed and out worked. Full credit to a very discipline and well organised Beaumaris team who had the game on their terms for the majority of the afternoon. We had our opportunities, but our entries inside 50 and our missed tackles really hurt us. We were made to pay, with Beauy being extremely efficient forward of centre and their key forwards getting excellent supply. Unfortunately Zac Grundmann was taken off on a stretcher after landing awkwardly and injuring his knee – fingers crossed it’s not as bad as first thought and he can be back at some stage this season. We all send him our well wishes. It wasn’t the ideal result, but there were plenty of lessons to take from the game. A nice wake up call to get early in the season. We look forward to responding next week! The Golds kept their winning start to the season going with a strong win over Beaumaris. After an even first quarter they stepped up their work rate, with much more effective, decisive ball movement in the second and third terms before easing off in the last to win by a comfortable 57 points (14.17.101 to 7.2.44). We were well served by a strong forward performance by Liam Manakis, who led and presented well and was rewarded with four goals. He was well supported by Pat Cook who bagged four goals of his own. There were some really pleasing aspects in the performance when the Golds put in place some of the strategies and game style that the club is seeking. This play was rewarded with strong second and third quarters, kicking 11 goals to two to establish an insurmountable lead. With such a decisive lead at the last break, the boys put the cues in the rack and cruised to the line. This could have been because Beaumaris couldn’t overtake them, but maybe they had one eye on next week’s opponent. It is hoped that switching off is not habit forming because the Golds need to learn the art of keeping their foot on the pedal all game – there will be harder challenges ahead and they’re coming each week. Better players were James Bailey who used the ball well when he had it, the aforementioned Liam Manakis and Pat Cook along with Josh Galbraith, Pat Hounihan, Danny Melissinos and Frank McCormack. The Golds were well worth their win and go into a top of the table clash with old rivals Old Xaverians next week. We started our final grading game with a few sore bodies as we backed up from Tuesday’s Anzac Day clash. Old Haileybury have a number of skilled players and we were outclassed from the bounce. By the time the first quarter finished, we’d had three players go down leaving us three on the bench. But as we’ve seen from the first game, this never impacts on our positive attitude and eagerness to continue learning. A number of changes at the first break allowed players to experience new positions on the field. Our inside 50’s improved and we almost had the goal umpire wave two flags on a number of occasions. The Girls did a great job in the third, with Old Haileybury struggling to score for the first ten minutes. But we lost another player and we were running out of petrol tickets. As is our trademark though, we kept at it and concentrated on structure and game style. Steph McMurray was outstanding in her first game in the ruck. Ellie Beatty had a great game down back and won most contests. Lee Brown and Sally Fyfield were again standouts. In the end we went down 15.12.102 to 0.1.1. We look forward the regrading and finding our feet amongst like minded teams. We looked forward to our first game at Dairy Bell for 2017 but with most of our boys playing their third game in five days, we needed a fast start against Old Paradians. I couldn’t have asked for a better first quarter, our quick hands to open up space combined with precision kicking to leading forwards saw nine goals on the board by quarter time. The quick ball movement was great, highlighted with Billy Cooke getting on the lead and bagging five goals by quarter time. Our structure held strong for most of the game as our backs pushed up and repelled Parade’s attacks. As the game progressed the ball was getting heavier due to the muddy centre wicket. Our legs began to tire and we lapsed into kicking long down the line, playing into Parade’s hands after they’d sent a few back to stem the flow after quarter time. Despite being tired, we tried to attack more to the top end in the last quarter and get the ball away from the ‘magnet’ the grandstand had become. There were a few skill errors due to fatigue, but by persisting with our game style in the last quarter it will bode us well for the future. We had a great all round contribution but young Pat Bohan was sensational in the ruck all day, Billy Cooke finished with seven majors, Elijah Kingsley bagged another three and provided a great target along with Tom Vance. The Roberts brothers were dominant, Jed controlling the back half and younger Cam providing plenty of drive from a wing. Adam Martuccio’s in-and-under efforts showed us how to lower your eyes and hit targets. Big ‘thank yous’ to Trish (Adam’s mum) for doing the match day team manager duties, Tom (Cam and Jed’s Dad) for running the rotations, Mark O’Connor catching a bus to the ground to be runner and Brian Watson for being a guiding hand to those new to match day requirements. We’ve got a big test next week against MHSOB, who had a good win on the weekend. The warriors took on Monash Clayton at their home ground, which could only be described as the best deck in Australia. Match preparation was as good as could be with players arriving between 10am and 11:15am for an 11:40am start. De La had a size advantage though the Monash players looked leaner and fitter. The first quarter was an arm wrestle which nearly expired early when the time keepers blew the siren at the 20 minute mark! The super-sized scoreboard with time clock meant we were having none of that. 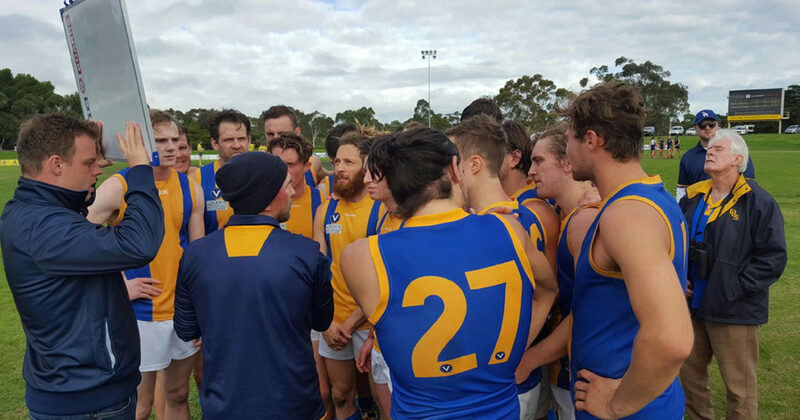 Scores were close at quarter time and De La without star players Oakley and Breda meant that others needed to step up… and they did. The match was won in the second quarter when De La wore down their hard running opponents with physical and smart football, kicking 5.4 to 0.1. The match flickered back into a contest with a number of players cramping in the third and forth quarters, but we steadied and our class and experience got us over the line. Special mention to Beau Hill who turned his ankle in an awkward contest and against coaches orders, had it strapped and locked before playing a pivotal role in the last quarter, stopping the Monash attack that kept coming right until the final siren. We’re away to Fitzroy next week which will be a good challenge as results are showing a much tighter completion than 2016. The Dino’s are up next at Hillside on 7 May @2.45pm, where they hope to continue on a winning way!